Today marks the 5th anniversary of my debut novel being published! 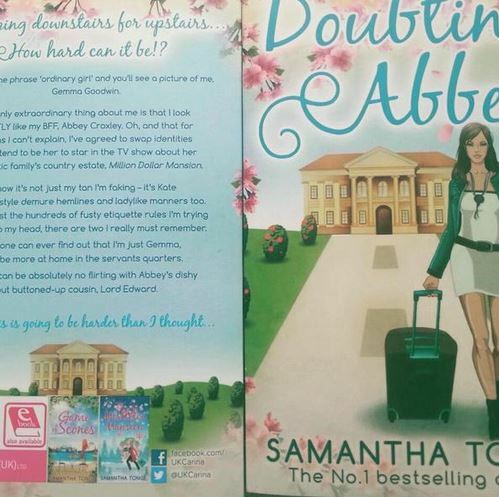 Doubting Abbey was inspired by Downton and became a Christmas bestseller. It was such an exciting time watching it climb the charts. At one stage I even had a Hollywood movie producer reading it. You can imagine the jumping up and down when that news came in! But today gives me an opportunity for reflection. And I’ve ended up needing mental health treatment. Whilst my career didn’t cause my alcohol and eating problems, it magnified them. 2013 to 2018 has been an intense time. One of the most intense periods of my whole life. self-care must be a top priority. I allowed my writing to stretch across each day to the exclusion of hobbies and getting out of the house. I allowed it to stretch across weekends. I allowed myself to become so involved with my career and social media that I began to think those things were actually *me*. That if a book topped the charts Sam Tonge was a success. That if a book didn’t Sam Tonge was a failure. And as my mental health deteriorated I began to feel as if I was living a double life, as if I had two faces – Samantha Tonge The Author and Sam Tonge who was secretly struggling. I paid the price for this. So, new authors who’ve just signed a deal… take a deep breath. Amazing things are ahead of you! But your writing career is not the sum of you. It may be a passion, a vocation, but ultimately it is a job and the peaks and troughs should not dictate your happiness. Now I’m just me, online and off, warts and all. And what a relief. LOOK AFTER YOUR MENTAL HEALTH. My tips for that are here. Thanks, Jenni. Yes, I think it’s very easy to believe every other author is having an amazing time when that’s often not the case at all. And it can be dangerous as we then reach a “well, it must be only me,” frame of mind and negativity can so quickly get out of control. Very kind. It’s so important to have real life author friends that sit with you over a coffee and give you a reality check. What we might not say on social media, we let spill out over a coffee. The RNA has been great for this. One friend in particular reassures me in the doubting moments. Without these friendships I would be struggling now.